Elevation: 1 836 metres... Approaching the big 2000m! Today starting out was the 1st day I felt a bit of thinish air! Firstly, I achieved my best daily average to date, 3.3 km/h for 9 hours, and yes that makes it a 30 km day! It wasn't all easy, but there was fun. I was so happy with that, you can't believe how good it felt taking off my boots, and climbing into my little tent, ready to devour a huge meal... Heaven on ice! What is always a bit scary when my boots come off is how my feet throb big time! The day started with pretty average sastrugi, but almost windless for a change. 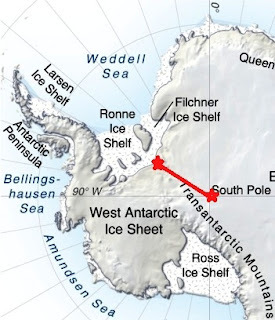 The ice was pretty good, and I did good mileage for the first two hours, and then I hit the 'Serengeti of Antarctica', you'll see why I call it that further below. This plain that opened out in front of me was TOTALLY sastrugi free, and looked almost like a snow groomed, ski park... Well, was this fun, just what I have been waiting for for a while now. Suddenly 'we' were REALLY skiing, gliding along at amazing speed, feeling like magic motion, and the rhythm just flowed. The incessant tug, tug, tug from 'my friend' the sled was no longer there as the continuous glide meant the pull power was constant, making for a pleasant ride. It's like a boat on the water that suddenly starts gong fast enough that it 'lifts itself' out of the water and gets onto a much faster, low resistance plane. I was feeling so good, all my cross country skiing training at Snowfarm in New Zealand was now paying off... There was just the quiet sound of the ski glides, it was also fun and exhilarating, so much so that I even missed the stop time for a break... And that NEVER happens! Well at the base of the hill was a sastrugi obstacle course that rapidly changed 'our' rhythm and then we were soon right into the realities of the hill that virtually on its own gave today's elevation gain. What a contrast. Antarctica was trying to break my spirit... It was straight back into noisy, slow 'plodding'. I've done quite a bit of that over the past few days, but the contrast to the 'Serengeti' was spirit breaking! With the plodding comes a motion like the gangling man, with two walking sticks, limbering from side to side tugging the sled each time, with a counter yank to the back and shoulders. The 'walking sticks' make a desperate grunt and squeak on the ice as they bite into the ice providing an anchor from sliding back, and stability, with some propulsion over the ice boulder terrain. The skis now make a loud, irritating clatter as I am forced to walk step by step, with unlikely efficient skis as shoes. The final humiliation comes as I glance to my left and have to watch my ridiculous looking shadow. It confirms I look like a drunken tramp, stumbling ahead, complete with all my belongs in a backpack and mattress strapped to its back! 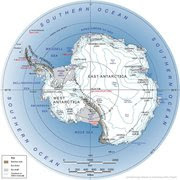 At the break, the GPS makes for depressing reading, as at 2.5 km/h it confirms Antarctica is trying to break my soul! I finally make it to the top of the hill, and with relief I stop to view from where I have cometh: Well the view back was breathtaking, from the bottom of the hill the Antarctic serengiti, where I had had so much fun, stretched out to the far horizon as a lighter shade of shimmering ice white, without a blemish, save for three largish charcoal coloured 'lakes' that were formed by shadows for clouds in the sky. With the hill behind me the last two hours of the day were not easy terrain but run on the motivation that 30km day was in reach if I focused! Another good weather day, a little cross wind for a change and 'fairly cold' temperature. I was hoping to dip below the 400km to-go mark, but at 403 that will have to wait till tomorrow. Right, so back to the Purpose of Life! On the Arctic that memorable day I concluded that rather than trying to find the answer to the question, we should rather just make sure: We don't WASTE our lives! Waste is a very negative and harsh word, but it's meant to be, because to quote the old saying: "Life is short", so anytime we are wasting it it's quite a serious personal 'life cime'. I sense those who aren't wasting their lives never have the need to answer the "What is the Purpose of Life?" question... They are living 'Their Purpose', and feel content. So, this all begs the question: When are we wasting our lives, in terms of this 'Purpose of Life' concept? Well that's where the Arctic thinking took me further, to how does one work out whether one is wasting one's life? But that's for tomorrow! There is a sound basis for testing; it's not all woolly stuff, so stay tuned! Well done on a great day.Cant wait for tomorrow. Howard, I so resonate with your NETT GIVER philosophy and it doesn't have to mean that we all need to become philanthropists of the highest order, but even in small ways, as you say, start by NOT TAKING. And somehow, eventually, the wheel turns, it always does. Helke and I are getting a lot of inspiration from your trip, so you're giving there. The flat section sounded like a welcome treat. I wonder if the russian coach's accented tips were bouncing in your head as you revelled in the glide. :-), Hoping for less sastrugi and better glide for a speedy last 400 for you, and comfy feet (if that's possible). Well done so far! Sounds like a very challenging day and perhaps your brain is a little tired as you think about "the purpose of life." I suppose in the grand scheme of things for everyone to be a "Net Giver,"is a good moral objective to shoot for. But I suspect there is more to it than simply adding up the pluses and minus and finding out that "more to it," isn't a waste of time. Finding out you have and need to satisfy that Spirit of adventure I believe says something about you personally and about your specific purpose as opposed to say mine. Awesome blog, LOVE where you are going with your theme of the purpose of life, nett giving and not wasting what we have. BUT lets clear up one thing..'your shadow looking like a drunken tramp? '...nah..you've been in the snow too long buddy....you in my mind are more like a snow gladiator! Much better visual!! It was cool to read that you did some of your preparation with the Lee family at Snowfarm....that's where we hang out when down under in winter. Good to hear you having a relationship and conversation with your sled, laughing when you fall, (but don't do that anymore) having fun bolting over the flater terrain, and then looking back on where you came from and enjoying the beauty of it. This is what I wish more of for you each day that you have left! Sandy T.
This comment section is working much better for me than clicking on the "envelope with the arrow on it" at the end of Howard's blog and going into a 300 limited charcter box with letters at the end to duplicate, which often were difficult to read. Much better, thanks! Sandy T.
Great blog entry today, the joy, the sled conversation and the philosophy make great reading. The minimising waste I can recall vividly from our work days together so that was no surprise but in those days you were more about being a nett achiever than a net giver; great to see how we change and your experiences have made for a fascinating environment for philosophy. Howard sounds awesome, you are truly inspiring and makes one look at the world in a different way. As you know I agree with your nett giving philosophy but it does need to be balanced with nett gain in order to be able to have choices. Sounds like you are overcoming the challenges well and the biggest one being the mental state of mind to remain focussed on the task and being positive. Howard, i'm enjoying your musings about life and also the comments of your circle of supporters.....lots of good, solid stuff to ponder.Work pressure does get in the way sometimes but using one's occupation to be a net giver is very rewarding and i resonate with your thinking. and mother nature is such a great leveller as we all experience from time to time. be safe and keep 'em coming....peter and pat. We are following your blog as you know, but we are having trouble commenting because our school IT guidelines are blocking it every couple of days! We would like to let you know what we are doing with our time...computer games, Skype, Facebook, listening to music, exercise. As far as answering your questions...we will discuss them over the next few days and get back to you. We do have a question for you...What is your foot telling you? The ESL class thinks that it is saying stop and take a rest and let it get better as they are having a hard time understanding the time/supplies issue. We will continue to talk about that as well. take care,.